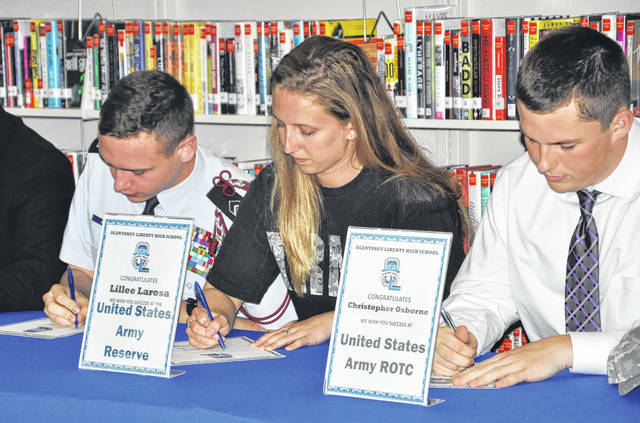 Pictured signing their “letters of intent” during Olentangy Liberty High School’s first-ever Military Signing Day on Wednesday are, left to right, Madison “Mason” Hart (Air Force ROTC), Lillee Larosa (Army Reserve) and Christopher Osborne (Army ROTC). 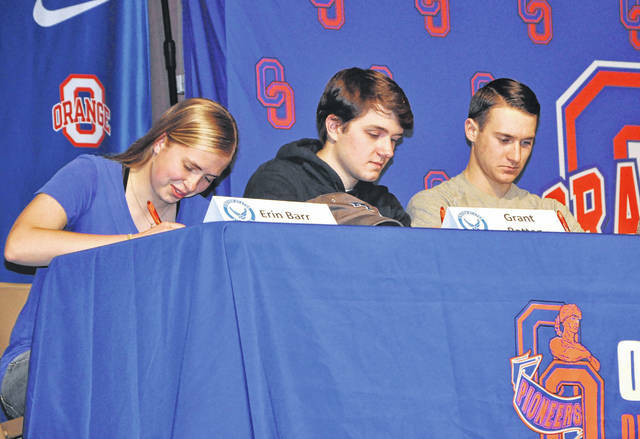 Pictured signing their “letters of intent” during Olentangy Orange High School’s first-ever Military Signing Day on Tuesday are, left to right, Erin Barr (Air Force), Grant Batten (Air Force ROTC) and Michael Miller (Air Force ROTC). High school athletes signing their letters of intent to commit their services to a school has become a spectacle. Seemingly every year the assemblies grow bigger and the coverage widens. This week, a pair of Olentangy Local School District high schools made sure their soon-to-be military members received the same treatment. Olentangy Orange held their first-ever Military Signing Day on Tuesday in front of a full auditorium, and Olentangy Liberty packed their library to honor their own on Wednesday. Combined, 20 students took part in the festivities. While they had already previously signed the considerable amount of paperwork to commit themselves, they were given their own letter of intent of sorts to sign in front of friends, family and media. The idea to give these students their own signing day was sparked by Gregg Flowers, a veteran and member of the Olentangy community. Flowers was also vital in the organization of Orange’s Military Appreciation Night in the fall. Raiff said the event was especially near and dear to him due to his four children all pursuing military careers. The school district plans to make the Military Signing Day a yearly event and have said Olentangy High School hopes to hold an event of their own next year. “It was great, the opportunity to recognize kids who are dedicating their time and lives to our country,” Liberty Principal Bill Warfield said. Those signing from Olentangy Orange were Erin Katherine Barr (Air Force Academy), Grant Colton Batten (Air Force ROTC), Michael Daniel Miller (Air Force ROTC), Jennifer Suzanne Brann (Air Force Reserves), Bryce Robert Koci (Army), Sarah Frances Leskovich (Army), Drew John Row (Army), Trenton Lee Closson (Army National Guard), Sebastian Malachi Guess (Army National Guard), Destiny Marie Lugo (Marines), Carson Lane Briggs (Navy) and Brayden Tyler Creasap (Navy). Miller was also presented with the Air Force ROTC high school scholarship. Approximately 8,200 students applied for scholarships across the country, and only 15 percent were awarded. The scholarship is worth up to $100,000. Miller will attend Bowling Green State University this fall. Liberty’s signees were Alejandro Luis Escamilla (Marines), Dmitri Samuel Minto (Marines), Brian Anthony Yannone (Marines), John “Jack” Robert Cobb (Air National Guard), Madison “Mason” Cecil Hart (Air Force ROTC), Matthew Carter Halvorson (Army National Guard), Christopher Edmond Osborne (Army ROTC) and Lillee Pauline Larosa (Army Reserve).